Proper audio wiring is almost as important to the performance of an stereo system as the amps, speakers, and subs used in the system. Amplifiers need power and speakers/subwoofers need wattage. Higher quality wiring is the key to making sure those components get the power and signal they need to run efficiently and sound their best. Amp Kit - An amplifier kit includes power, ground, and remote wire which are all required for an amplifier to function. Additionally, an amp kit includes a fuse, fuse holder, and some other convenient installation accessories that allow you to perform a clean install without having to buy a bunch of parts one at a time. 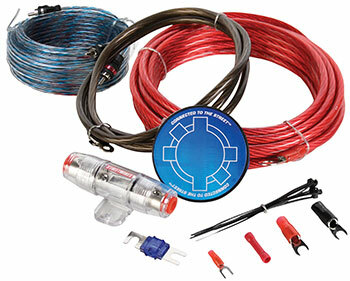 MTX StreetWires amp kits are available with different wire gauge and construction options. The lower the gauge number, the higher number of metal strands in the cable and the higher the number of metal strands in the cable, the more current flows. You wouldn't try to put out a house fire with a garden house if a better option was available. Remember your system is only as good as its weakest link, choose an amplifier kit that has the correct wire for your amplifier's power rating and your performance expectation. Interconnects - RCA interconnects deliver the signal from your source unit (car radio) to your amplifier. They are available in multiple lengths to suit the needs of any installation and vehicle. Factory radios do not generally have RCA outputs so you may need a line output converter to convert the speaker level output on your radio to an RCA signal you can connect to the amplifier. Power wire is available in different quality levels. The best thing to look for when researching power wire is the amount of Oxygen Free Copper (OFC) used in the construction. Cables like the ZN5 cables are constructed using 100% OFC therefore providing the maximum power transfer with the least amount of loss. Other cables use a blend of OFC with copper clad aluminum (CCA) or just CCA, which is commonly found in lower priced power wire and amplifier kits. Speaker Wire: The same principles apply to speaker wire, which apply to power wire. Your amplifier outputs wattage to your subwoofers or speakers. Smaller wire, remember the higher the number the thinner the wire, is not able to transport the RMS output of the amplifier. If you connect a 1000-watt RMS subwoofer to a 1000-watt amplifier with an 18-gauge speaker wire, you are not going to get 1000 watts to the subwoofer and therefore you are missing out on the full experience of the sub. Additionally, speaker wire that has a twisted pair construction like StreetWires UCT series speaker wire, rejects radio frequency interference resulting in higher sound quality and lower distortion. Interconnects: Audio signals from your deck, or radio, are small currents. They need a good connection for good conduction of the signal. If a connector is not secure, the signal will distort or stop. The lower the quality of the metal coating on the connector, the sooner the metal can oxidize, which also causes distortion with eventual loss of signal. MTX sells three grades of interconnects to connect your car deck audio output to the your amplifier. ZN5 audio interconnects are designed as an affordable, dynamic alternative to cheap, noisy cables, ZN5 Interconnects improve the audio experience in any mobile audio system. ZeroNoise5 interconnects offer better noise rejection, signal transfer, and conductor insulation than competing brands. Utilizing oxygen-free copper (OFC) conductors, twisted pair design, and a split center pin, the ZeroNoise5 series is ideal for anyone looking for excellent performance at an economical price. ZN3 audio interconnects offer high performance and at an incredible price. ZN3 interconnects are a step up from the ZN1 interconnects and add additional features which highlight their true value. ZN3 interconnects feature a twisted pair design, sure grip molded body, split center pin, and a Poly-flex jacket to ensure optimal signal transfer and reduced interference from external sources for a truly great listening experience. As you can see there are a lot of items to think about when choosing wire because it plays a huge role in the quality of your sound system. Upgrading all of your wires will ultimately result in a better sounding system all around.